While the main emphasis of the Great War was on the Western Front of France and Belgium, the British Army also took part in what was a lesser known conflict, but one of equal intensity and drama. This was at Gallipoli, on the shores of Turkey, between April 1915 and January 1916. By December 1914, the war on the Western Front had ground to a halt in a stalemate of trench warfare, and Winston Churchill, then First Lord of the Admiralty, proposed a strategy to take Turkey, a German ally, out of the war. This could force Germany to fight on two fronts and could free up the Dardanelles waterway at Gallipoli. While the concept was sound, its execution was not, as it was hastily planned, and inadequately resourced. 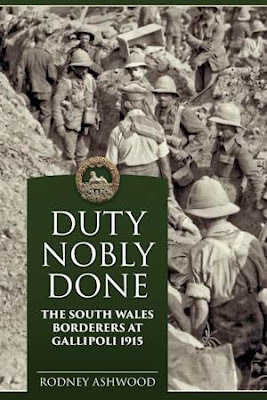 The 2nd Battalion the South Wales Borderers was present throughout the whole campaign and was the only Welsh battalion to take part in the amphibious assault on 25 April 1915. Other historians give little credence to the success of the battalion on that day and this book sets out to redress the balance. The 4th Battalion landed at Gallipoli a few months later, to take part in the second main offensive, at Suvla Bay, in August 1915. This campaign took part amidst the most appalling conditions, such as the unrelenting heat of a mediterranean summer, a lack of water, poor food, inadequate equipment and without proper sanitation. Sickness and disease were rife, and at the height of the war there were up to 5,000 cases of dysentery a week. Both battalions of this famous Welsh regiment endured the privations of the campaign with great stoicism, courage and dignity and were amongst the last soldiers to leave the peninsula during the final evacuation in January 1916. By a clever weave of official records and personal anecdotes, most of which have never been published before, the reader is taken on a journey of highs and lows, depicting the reality of life on active service.